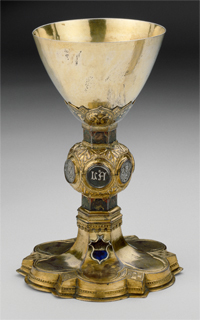 Many years ago I was wandering about the British Museum when I came across a most beautiful chalice on display. At the time I was a bit shocked and sadden to think that one of the most sacred objects in Catholic liturgy was on display in such a secular setting. I remember thinking that now I knew how Native Americans feel when they see objects from their sacred burial grounds displayed in museums in America. What escaped me that day was the thought that by displaying these objects in a museum, those who do not know the history of the Church might think these objects are remnants of a distant past, when in fact, Sacred Chalices are in use to worship God in the Holy Sacrifice of the mass every day, all over the world. I just found an article at "A Reluctant Sinner" blog which reminded me of that day in London. One of the bizarre facts about the age we live in is that many of our secular institutions, especially museums, treat the Catholic Church as something that used to exist in the distant past, but which has now somehow disappeared from the face of the earth.